IKEA Supply AG of Switzerland is recalling about 9,700 GLIVARP extendable dining tables sold in the U.S. and Canada. The table’s glass extension leaf can detach and fall, posing a laceration hazard. The firm has received three reports of the table’s glass extension leaf detaching and falling unexpectedly, one of which included a minor injury where no medical attention was needed. 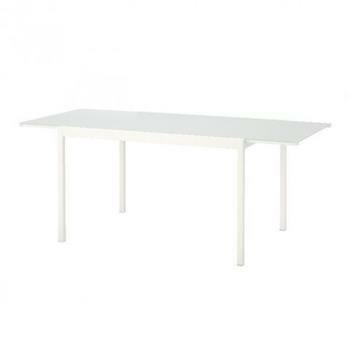 This recall involves IKEA GLIVARP extendable dining tables in white with four steel legs and a glass table top with an extension that can be pulled out to the side. They measure about 29 inches tall by 49 inches long. The glass table top extension measures about 25 inches long. The supplier number (12003) is printed on a sticker on the underside of the table frame. “GLIVARP” and the IKEA logo are also printed on the sticker. The tables, manufactured in Romania, were sold exclusively at IKEA stores nationwide and online at www.ikea-usa.com from February 2017, through October 2018, for about $300. Consumers may contact IKEA toll-free at (888) 966-4532 anytime or online at www.ikea-usa.com and click on Press Room at the bottom of the page, then on Product Recalls at the top of the page for more information.